Cases involving meritorious acts of Nursing Home abuse and neglect are on the rise in California. While our elderly population continues to rise, more and more civil claims for abuse and neglect are being brought against nursing homes and other elder care facilities in California. Claims against nursing homes and other elder care facilities in California are viable, even where the elderly victim has died following abuse or neglect at a care facility. This exception was made possible the 1991 enactment of California’s Elder Abuse and Neglect Act, formally referred to as California’s Elder and Dependent Adult Civil Protection Act (“EADACPA” or simply “The Elder Abuse Act”). This statutory body of law can be found at Welfare and Institutions Code section 15600, et al., and provides enhanced remedies for elderly victims of nursing home abuse and/or neglect here in California. While the statute itself is complex and must only be utilized under the correct factual circumstances, attorneys who handle claims of abuse and/or neglect under California’s statutory provision of law can greatly increase their clients’ chances of recovery when used properly, and even bring accountability to the aggrieved elder victim post-mortem. When violations of the Elder Abuse Act are proven, attorneys practicing under California’s Nursing Home Abuse and Neglect Act can recover attorneys’ fees and costs, making the net recovery for their clients more significant. This is a rare exception to California law and one that was set out by the Legislature to encourage attorneys to take on cases for victims of nursing homes abuse and/or neglect. This provision can specifically be found at Welfare and Institutions Code section 15657. What many attorneys who do not routinely handle cases in California involving nursing home abuse and neglect realize is that the statute (“The Elder Abuse Act”) provides for these enhanced remedies against all types of care facilities that provide care towards our elderly adults. Care Facilities included are: (1) Nursing Homes, (2) Residential Care Facilities for the Elderly (“RCFEs”), (3) Assisted Living Facilities, (4) Long Term Acute Care Facilities (“LTACs”), (5) In-Home Health Care Providers, (6) Hospitals, (7) Drug and Alcohol Rehabilitation Centers, (8) Facilities for Mentally Challenged Adults, and even (9) Hospitals. The Elder Abuse Act has even been successfully utilized against physicians. While the Elder Abuse statute defines an elderly adult as anyone over the age of 65, The Elder Abuse Act applies to anyone who is between the ages of 18-years-old and 64-years-old but lives in a custodial care facility and relies upon others for assistance with their activities of daily living – acts such as dressing, grooming, bathing, eating, or carrying on normal routine daily functions. California’s Elder Abuse Act is a powerful tool when used correctly. It is legally permitted to be used when care has failed to be rendered versus when the provision of care rendered is simply poor or leads to one suffering injury. 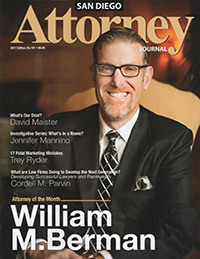 These enhanced remedies available to attorneys in California who counsel clients in bringing claims for Abuse or Neglect provide an additional basis for recovery, and one that under certain circumstances relieve the injured party from the $250,000 “caps” that apply to those subject to acts of mere professional malpractice/medical malpractice. California’s Elder Abuse Act is indeed a powerful statutory body of law and for those attorneys who understand the nuances of the law, can greatly assist their clients in obtaining the greatest extent of justice possible under the law. Run by firm Founding and Managing Partner William M. Berman who himself is considered by his peers and other legal authorities as a best Top 10 rated Attorney in this area of the law, the attorneys at Berman & Riedel, LLP, handle abuse and neglect cases involving nursing homes and similar elder care facilities throughout all of California. The firm Berman & Riedel, LLP, is recognized and having one of the largest and most successful practices throughout the entire state of California when dealing with California’s Elder Abuse Act. The firm has been handling elder abuse and neglect cases since 1998 with great success, having handled more claims brought under this very specialized statutory body of law than most other California attorneys who litigate cases involving actions of elder abuse and neglect. Elder abuse and neglect makes a victim of vulnerable elderly residents who often rely on the caretakers to tend to their daily needs, including feeding, hygiene, and even shifting in bed. When neglected and left to care for themselves, these elderly residents are virtually helpless, and that isolation can often be overwhelming. Elder abuse and neglect takes on many forms, including physical, mental, and financial injuries. Further, these injuries can be the result of recurrent conduct or one single injury-producing event. Below is a sampling of our elder abuse case settlements from throughout California. For a full listing of case results please visit our case results page. $4,250,000 – Nursing home resident suffered serious bodily injuries after being purposefully ignored by staff. $2,000,000 – Wrongful death due to severe fall and head trauma when nursing home resident attempted to walk to bathroom after staff failed to respond to call light. $1,600,000 – Hospital over-medicated a patient, which induced cardiac and respiratory arrest resulting in brain damage. $1,000,000 – Blind resident was improperly monitored and suffered multiple falls while at elder care center. $920,000 – Premature death of a resident who developed open wounds infected with drug-resistant bacteria due to failure of heath care center to implement appropriate care plan. To set up a free case evaluation with one of our attorneys, please call (858) 350-8855 or complete our case questionnaire.